JOIN US IN CELEBRATING WORLD OVARIAN CANCER DAY ON THE 8TH OF MAY! This year, we will share in a worldwide campaign launched from Berlin – the emotionally moving video „Chocolate“ will go viral around the world on social media. On May 8, this video clip will be simultaneously posted in more than 100 social communities worldwide for the first time, thus connecting and informing as many people as possible about this rare but very serious gynaecological disease. The campaign is supported by the largest European and worldwide medical groups for ovarian cancer, including European Society of Gynaecological Oncology (ESGO), Gynecologic Cancer Intergroup, International Gynecological Cancer Society (IGCS) and European Network of Gynaecological Cancer Advocacy Groups (ENGAGe). Using sensitive words, great music and lots of chocolate the video shows what goes on inside a patient after receiving the diagnosis and what emotions such as anger, grief and hope are experienced. Together with the renowned photo and video artist Daniel Hetzel and the composer Mathias Fritsche, a moving video clip was created. power and it also encourages people. age of 31 from the consequences of ovarian cancer. and share Nancy’s story with the world. Please visit the link to read the full article and find out about how you can benefit as a PARSGO Member! The 17th Biennial Meeting of the International Gynecologic Cancer Society (IGCS 2018) will be held in the city of Kyoto, Japan on September 14–16, 2018. As Strategic Alliance Members, PARSGO members are now eligible for a reduced registration rate for the IGCS Biennial Meeting. 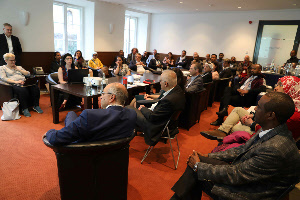 In December 2018, a delegation of the Faculty of Medicine and Pharmacy at the University Hassan II, Casablanca, visited the German capital Berlin to prepare a cooperation with the University Hospital Charité. Please visit the link to read a report at the Les Éco website (in French). 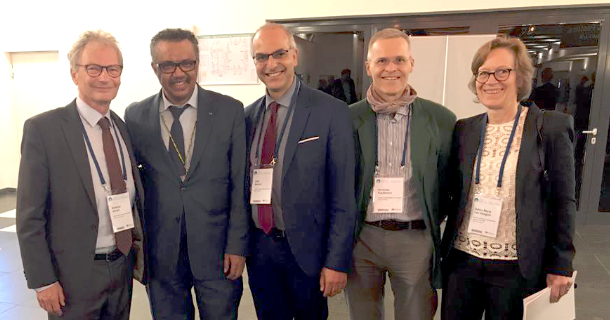 Director-General, and Mrs. von Stieglitz from the GIZ at the World Health Summit 2018 in Berlin. For more, please click on the logo to the right.